For entirely selfish reasons I was terribly excited when I came across this verse, and dived immediately into a study of it. Basically, the name of this site – which hosts this entire verse-centric bible study that we’re doing here at reversingverses.com was basically born out of the simple concept of reversing verses. It’s a play of the word reverse, of course. To re-verse it, to put it into words again. To examine it by going back and forth. Anyway, that’s got nothing to do with this verse, though. The term ‘reverse’ can even be considered to be slightly inappropriate – it’s really a little bit more interpreted than translated compared to other versions. Still, I’m sticking to NIV. In today’s study we will look into the supremacy of our Lord and what that means for us. Yes, and from ancient days I am he – when you think of ancient, what do you think of? In Biblical terms, maybe the times of Abraham, Moses or David. In Christian terms, maybe the early Church days. In archaeological terms, maybe the days of dinosaurs. In terms of technology, maybe the times of cavemen. I’m Chinese by race, so I’ll think of the warring dynasties of ancient China. Yet, how ancient is our God? In God’s own terms, what exactly is ancient? Other versions offer an interesting variety of interpretations to this phrase. KJV states before the day was I am he; NLT states from eternity to eternity – NASB is similar; ESV states henceforth – a notably different point of view. How do we define ‘ancient’ from the point of view of one who existed before time itself, one whose existence is beyond and above time, one who was already there from the beginning, one who isn’t created, doesn’t have a time of creation, and hence doesn’t have an ancestry, unlike us? God’s ‘ancient’ definitely didn’t mean Abraham, or David, or Christ, or Luther. God was God right from the beginning of our time, and beyond that, his idea of ‘ancient days’ is something that we can probably never fathom. 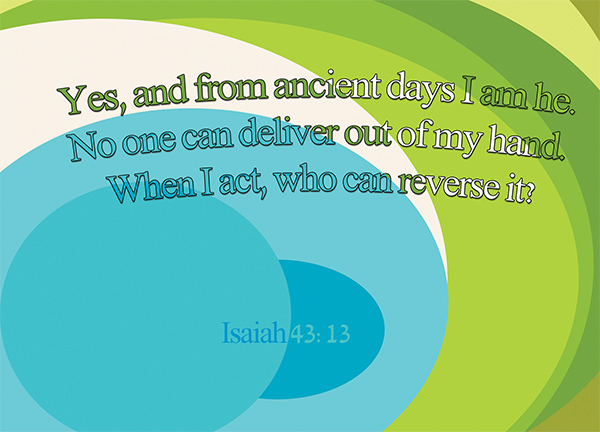 No one can deliver out of my hand – oh, indeed, who can? To put this crudely, who can play god except for God himself? God’s entire discourse with Job from Job 38-41 struck me deeply. Every single verse from that discourse screams Isaiah 43:13 at me – screams God’s sovereignty, God’s legitimacy, God’s power, God’s might, God’s timelessness, God’s eternality, God’s vastness and my own helplessness and ignorance at me. Just quoting you a short passage – Where were you when I laid the earth’s foundation? Tell me, if you understand. Who marked off its dimensions? Surely you know! Who stretched a measuring line across it? On what were its footings set, or who laid its cornerstone – while the morning stars sang together and all the angels shouted for joy? [Job 38:4-7]. Indeed, we weren’t around, we don’t quite understand, we don’t really know. As much as it puts things in our perspective of God’s greatness as compared to our own inadequacies, and drills into us our need to rely on God, it also tells us that we do not need to worry. Look at the birds of the air; they do not sow or reap or store away in barns, and yet your heavenly Father feeds them. Are you not much more valuable than they? [Matthew 6:26|Article] Because God is the one in control, and because no-one – not us, and not the evil ones – can deliver out of God’s hand, we do not need to worry, and we can single-mindedly follow God. When I act, who can reverse it? – The answer was given in the previous phrase: no one. When God acts, no one can reverse it. No one can undo it. No one can prevent it. No one can hinder it. No one can turn it back – these are all the various translations across the versions. Everything that God does, everything that he says, everything written in the Bible, everything promised to us – no one can reverse it. One of the most prominent examples would be salvation. Once promised, it cannot be reversed. You can lose your faith, but you will never lose your salvation. Well, this is yet another hugely debated topic with strong arguments for either sides and verses to back them up, so I won’t go into that. At the end of the day, God has no superior who can stand in his way. God doesn’t even have an equal – every other being in existence are far lower than him. If God is for us, who can be against us? [Rom 8:31] There are many who will try to oppose, try to hinder, try to stop, try to interfere. But at the end of the day, they won’t be able to stand against God. The same goes for us as well. When we try to deny God, oppose God, reject God, go against God, we will eventually discover that we cannot – because we simply are powerless. He is great, and because he is great, and because he is greater than anything else, we don’t have to worry at all. For neither death nor life, neither angels nor demons, neither the present nor the future, nor any powers, neither height nor depth, nor anything else in all creation, will be able to separate us from the love of God that is in Christ Jesus our Lord [Rom 8:38-39].